Oscar Wao is an overweight nerd in New Jersey who dreams of one day becoming “the Dominican JRR Tolkien .” More than anything, Oscar wants a girlfriend, but the gals are sadly not impressed by his gargantuan vocabulary and mastery of role playing games. The novel is a contemporary epic that spans two countries and three generations: Oscar’s travails have their roots in a family curse, which got his grandfather imprisoned under the dictatorial Trujillo regime in the DR, and later left his mother for dead in a canefield until she found salvation in a mystical mongoose. Speaking of brilliant characterization, Oscar is destined to be one of the great characters of literature. His Spock-like dialogue; the alienation he feels because of his race, weight, and sheer nerdiness; his earnest but mostly futile attempts to turn things around for himself – all of these make him an incredibly original and sympathetic character. One word of warning, though: a lot of people have reported trouble getting into the book at first, including me. One friend of mine said she had trouble with the narrator’s colloquial style. That didn’t bother me, but I did find myself resisting the relatively high level of “telling” – a lot of long, sweeping narratives (including footnotes!) with relatively few dramatic scenes. In that way, it’s not all that different from One Hundred Years of Solitude and a lot of other works of magic realism, which undoubtedly influenced Diaz. As with Solitude, once I got into it, I loved it. I actually enjoyed watching how Diaz managed to break the sacred show-it-don’t-tell-it-rule left and right and still create an incredibly compelling, richly detailed story. 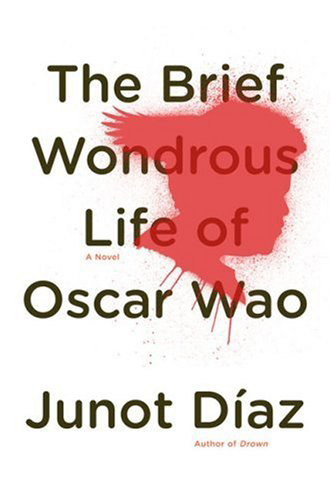 I’m a bit late on the bandwagon with this one, since Junot Diaz already won the Pulitzer Prize for Oscar Wao, but I’ve been a fan of his ever since I read his short-story collection, Drown, a few years ago. Buy both books, read them, give them to friends and family for the holidays, and bask in the wonder…. This entry was posted in Fiction, Recommended books and tagged Dominican literature, Hispanic literature, Hispanics, Junot Diaz, Latinos, magic realism, Oscar Wao, writing by benfrancisco. Bookmark the permalink. I just heard a live-to-tape interview done by City Arts & Lectures (http://www.cityarts.net/) with Diaz — the audience acted like he was a rock star, and really, he seems like a truly exceptional person: warm, funny, modest, driven, selfless. It makes me want to go and put that book on my Amazon wish list RIGHT NOW! Yeah, I saw Junot Diaz on an interview too, and he came across as remarkably humble and easy-going. And people I know who know people who know him say that he’s just a down-to-earth guy. It’s nice when amazing writers are also just cool people! I’ve had that envy moment, when i read Heinlein’s The Roads Must Roll – i’d thought i was the first to think of giant conveyor belts for people! This was in my childhood and has happened many times since with different authors. I comfort myself by thinking the only way to become good is to read the best. You’ve prompted me to look at ‘Pyramus and Thisbe’ in Wikipedia – i knew Shakespeare had taken it from Ovid, but not that Ovid set it in Babylon. I’ve learnt something.